Easter is a time for celebration, particularly when it comes to food, with lamb often being a popular choice at many a dinner table. 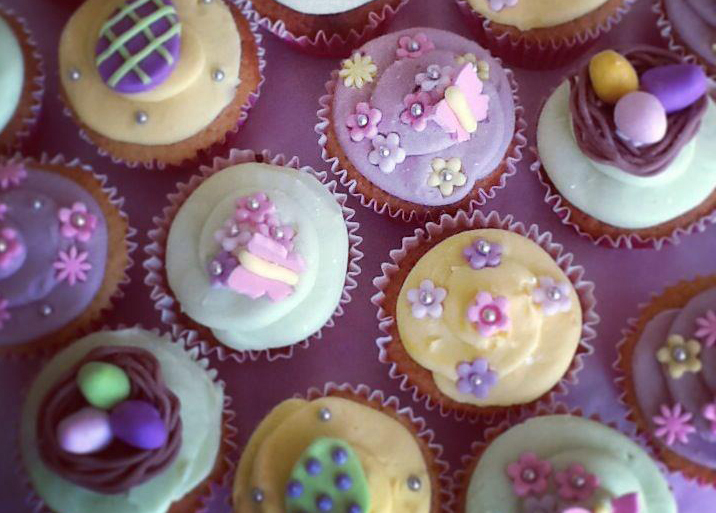 Today we’re concentrating on Easter treats as we create some Easter cupcakes for you to get your teeth stuck into. So once you’ve finished with the mountains of chocolate and the bundles of Easter eggs, try out this cupcake recipe, and enjoy with all the family! We made the decorations using chocolate mini eggs, some fondant icing and good quality food colouring. You can get creative in your own style and make any themed decorations. Preheat the oven to 170C and line a 12-hole muffin or cupcake tin with paper cases. Put your flour, cocoa powder, sugar, baking powder, salt and butter into a large bowl and beat slowly with a whisk or electric mixer (use the paddle attachment). Mix the ingredients until they are combined to a sandy consistency. Whisk the milk, egg and vanilla extract together into a jug or small bowl and slowly pour this into your flour mix. Combine both mixes using your whisk or mixer and ensure you get rid of any lumps. Slowly pour the remaining milk into the bowl and whisk together until smooth. Spoon your mixture into paper bun cases, filling the bun case to about 2/3. Once your bun cases have been filled, put your bun tray into the centre of the pre-heated oven and bake for 20-25 minutes. Insert a skewer into the middle of the cupcakes to ensure they are cooked right through. Once baked, set aside to cool for 10 minutes, then remove from the tin and cool on a wire rack. While the cupcakes are cooling, begin to make the Easter themed decorations. You can get really creative with these. Take a small amount of fondant and mix well with the food colouring of your choice and mould into different shaped decorations, including eggs and bunnies. Top Tip: use food grade gloves to protect your hands from the food colouring when you are colouring the fondant. Beat the butter in a large bowl until soft, we used an electric mixer. Add half the icing sugar and beat until smooth. Add the remaining icing sugar and one tablespoon of the milk and beat until the mixture is smooth and creamy. Add a couple of drops of green food colouring and mix until well combined. Spoon the icing into a piping bag with a star nozzle and pipe the icing onto the cooled cup cakes. 5. DECORATE THE CUPCAKES AND ENJOY! Cover your cupcakes with your fondant icing, add your decorations and enjoy with the family. What are you planning to create this weekend for an Easter treat? Share your creations with us in the comments section below or by connecting with Pikalily on Facebook and Twitter.